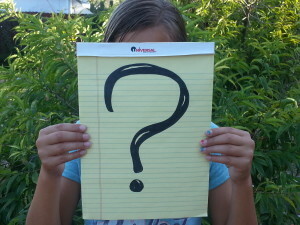 Home > Our Blogs > Learn+Teach+Share > "What ARE you?" As an educator, I've always gotten a little antsy right about now with the anticipation and excitement of a new school year on the horizon. This August brought even more anticipation because my youngest child just started kindergarten. My older two girls are firmly in middle school with their successful navigation of elementary school behind them, but my youngest daughter is just beginning the journey. When I took her for that first day of school, I was surrounded by parents fretting about typical kindergarten concerns. Many gave parting words of advice: Eat all your lunch. Be nice. Listen to your teacher. You'll be okay, I promise! I can relate to all of that of course, but the one real anxiety I have, I don't voice in the kindergarten yard: I hope you aren't caught too off guard when kids ask, "What ARE you?" My husband and I share a lot in common. We both grew up in Los Angeles, we're also both experienced history teachers and seasoned high school coaches. It's also worth mentioning that he's white and I'm Mexican. Since there is nothing usual about this in the 21st century, in vastly diverse Los Angeles, I wasn't quite ready eight years ago when my oldest came home from kindergarten with all sorts of questions and insecurities about identity. At age five, she had already been called upon to explain herself to peers who wanted to know, "What ARE you?" I remember that first conversation so vividly. Over dinner, my daughter looked straight at me and matter-of-factly proclaimed that, "We don't match." From her solemn expression, I knew she didn't mean our outfits, so I pressed her for clarification. "What doesn't match?" And then she whispered, as if it was something shameful, "Mommy, you're brown. Daddy's white and I'm white, but you're brown." I almost choked on my food. I felt tears welling up in my eyes. The seriousness in her face, her hushed tones, it was as if she was a doctor telling me I had an incurable disease. So many thoughts flooded my mind, alarms went off in my head, but I managed to ask, "Oh yeah, who told you this?" Unfazed, my daughter replied, "The kids at school. They keep wanting to know what I am." I remember struggling to formulate a response on the spot. All my years of teaching high schoolers about race and identity did not prepare me for how to explain things in terms a five year old would understand. As it was, my daughter wasn't too caught up in the identity piece yet, she just really wanted to know about color, as in, "Why are you and Daddy different colors? Why don't we all 'match' if we are a family?" Terribly complex questions with no simple answers. I gave her the best response I could but I realized at that moment that our conversations about race and identity were only just beginning. And it's true. My oldest daughter and I have had an ongoing dialogue about these things from that day on. I also made it a point to bring my middle daughter into the conversations too. She was a little older when she got the "What are you?" question, but not much. She was, however, better prepared. Now it's my youngest daughter's turn. She's also the lightest of the bunch, with honey-colored hair and light skin. When she was a baby and still had blue eyes, complete strangers felt the need to express their surprise that she was my biological child. I know it's just a matter of time before the other kids call her out on her "non-matching" mommy. "What ARE you?" has always been a loaded question. Race is a social construct, "imaginary lines" if you will, however with very real consequences. Learning to navigate the terrain is difficult because the landscape is always shifting. I know it's imperative to teach my daughters about race, ethnicity, and other aspects of identity, not only so they can have a better understanding of themselves, but also that they may be compassionate to and respectful of their fellow humans. People ask "What are you?" because they desire to sort and categorize information. And while I don't mind sharing my ethnic identity, I do resist being placed in a box of stereotypes that an individual might hold about my group. Sharing WHAT I am takes only a second, but sharing WHO I am can take a lifetime. Knowing what people are in your school creates statistics, but knowing who people are builds community. How do you talk about different aspects of identity with your students or with your own children? How have you encouraged them to deepen their thinking about the complexity of identity? Stephanie Carrillo is a 10th grade history teacher and the Director of Diversity and Inclusion at Campbell Hall Episcopal. An L.A. native, Stephanie has taught in Los Angeles schools for more than 20 years and has a particular passion for area art, history, and culture. Stephanie is also a member of Facing History and Ourselves Teacher Leadership Team and she enjoys collaborating with educators in the Los Angeles Partnership Network.